Why the love affair with fixed-prices? I’ve been reading another report by the great and the good into the ailments of capex and construction projects. 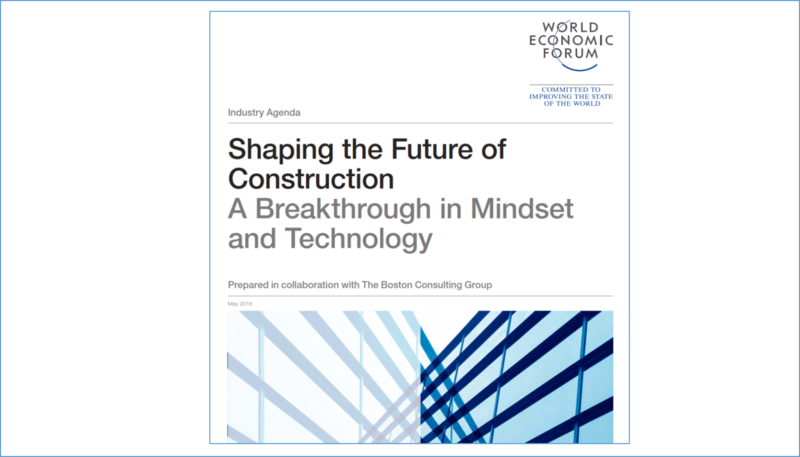 Shaping the Future of Construction: A Breakthrough in Mindset and Technology, was been published in May 2016, by the World Economic Forum – the organisation behind the annual get together of the world’s movers and shakers in Davos every year. And it is one of the few such reports that addresses the issues Robert and I wrote about in our book, and comes to the same conclusion that we did: The current system is broken. If I look at the 30 main recommendations in the report (alongside), using fixed prices to procure the key services needed by projects inhibits achieving the majority. The WEF report agrees with us on this point, though they dont seem to have made the explicit link. The reason I worry about this is that anyone reading the report might see solving the problem as a big project in itself, and something that an individual company cant implement by themselves. 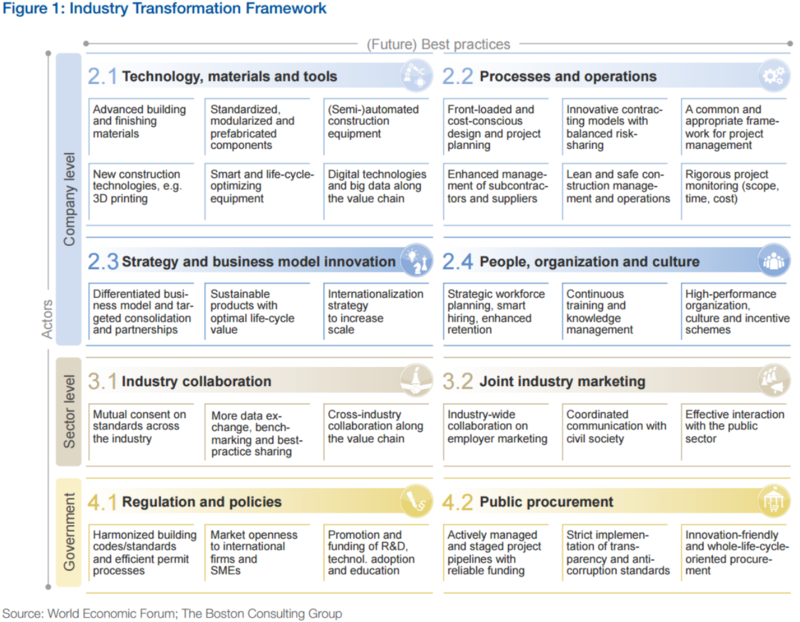 After all, how can you spare the time to focus on implementing all 30 transformation elements? So the report is put into a drawer or folder, and we’ll wait until ‘someone else’ does something. The main reason why I keep writing about this topic, is becasue I believe passionately that an individual company or a single project can change what they do, and achieve the benefits that this report highlights. You dont need to treat the change as 30 independent actions. Just make two fundamental changes, and they will feed through to positively impact most of the other areas. They are the capex project industry’s leverage points. This is because, at the root of the many issues in the industry, is how we put the team together on a project, and how we contract the various team members. The convoluted design structure, the late involvement of those who build and make the physical assets, and the expectation of each member of the chain to take a slice of the money, all contribute to waste and excess overhead, with armies of contract policemen fighting at each contractual border. So it was great to read a report that highlights this as a key problem. Over the past few years we have read dozens of reports like this one into the problems of the industry, and how they might be overcome. This is one of the few that recognises the need to change the selection and contract process used by projects. It doesn’t go into detail, but it provides a very powerful support to one of the main recommendations in Breakthrough Project Management: Select your team early, and align the financial interests of the client and main supply members. The report hedges its bets on this topic, and (in my view) confuses readers by mentioning things like PPP, DB (design and build), and ECI (early contractor involvement) as ‘contracting models’. I dont think they are full models as such, for example, Project Alliancing implies ECI and D&B as integral parts of the approach. D&B, refers to the scope of work more than the type of contract – it can still be let on a fixed price, or on time-and-materials basis. It doesnt inherently require aligned financial interests. Also I’m not sure PPP is a project contracting model either, it is more a project funding approach. The supply chain on a PPP project can be selected and managed in a traditional way. The report also claims that collaborative models “increases the risk of conflict”, but then gives no supporting evidence to this claim. In my view if a project alliance does have more conflict, then it is likely that it wasn’t set up properly. One of the potential problems with reports such as this one is that the solution to today’s problem seems somewhat out-of-reach to most players in the construction field. That is one of the main reasons we wrote our book about Breakthrough Project Management – because this doesnt need to be the case. Any project client, or any main contractor – at almost any scale – can apply these ideas, and they will deliver immediate benefits on the first project you use them on. One of the things I have been struggling to understand is why organisations are not changing how they manage projects? Surely they would love to have projects delivered more reliably, faster, and costing less? And wouldn’t they want to deliver more projects with the same resources? I can kind of understand why contractors go along with the starus quo – after all “The client is always right, even when they are wrong.” Nothing is forcing them to change, and in general they are better than most clients at playing today’s game. But the recommendations that we make in our book, and the WEF make in their report, can be applied by a main contractor – after all most of them spend 75-85% of the contract value with their supply chain, and they have identical issues related to fixed-price contracts and risk offloading. And they too could get the benefits of faster delivery at lower cost. Surely they too could use this to grow their business? So why do we keep doing projects the same way – letting business on fixed-price contracts? What is stopping the industry changing? Please share your thoughts by commenting either below or on LinkedIn where I will also publish this post – or get in touch directly.